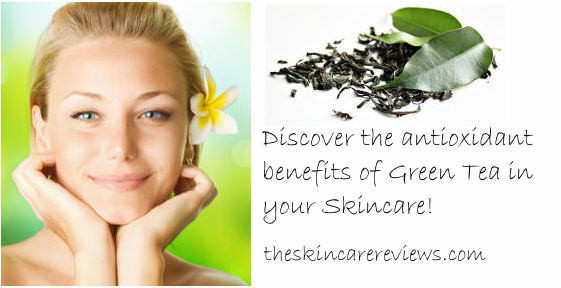 Green tea has long been known to be a powerful antioxidant that can fight free radicals and prevent or delay aging. Still, I was surprised to read in Wikipedia that green tea extract has twice more antioxidant properties than vitamin C! This does not mean that you can quickly replace your vitamin serum with a green tea skincare product because the exact amount of green tea used in skincare products can hardly be traced, so we can´t know exactly each product’s potency when it comes to green tea. The only thing you can do if you want a higher amount of green tea in your moisturizer is to check whether it appears on the top of the ingredients list or of course contact the manufacturer for more details. Since green tea is well known due to its antioxidant and anti inflammatory properties, it is often used in skincare products as a fine ingredient. The OZ Naturals Facial Moisturizer contains Japanese Green Tea Leaf Extract as one of its first ingredients as well as wildcrafted green tea. It also has a number of great ingredients such as organic sulfur, Vitamin C, Algae Keratin extract, vitamin E as well as rosehip seed oil, organic herbal infusion and others. It comes in 4 ounces, it is 97.2% natural, 72% organic and free of fragrance. The company recommends it for all types of skin as a daily face moisturizer but also as an after sun restorative treatment. Just remember that if you use it as a day moisturizer and although it contains vitamin C, you will also need a sunscreen for full protection. The product´s purchase is followed by a 30 day return and refund policy. Reviews for this Green Tea Moisturizer are quite positive with most consumer finding that it offers them many skin healthy benefits. They like that it doesn’t irritate sensitive skin and that it brightens and softens skin. It absorbs quickly, does not leave any greasy residue behind and several users have stated that their skin feels tighter and looks shiny with less visible wrinkles. Users with oily or combination skin say it is perfect for their type of skin but probably not similarly great for people who have combination skin with dry areas since these users claim that the product is not moisturizing enough if you are dealing with dry skin. Some users have also mentioned that its consistency is runny rather than creamy as they would have preferred it to be. The Radha Beauty Retinol Moisturizer contains as its key ingredients 2.5% Retinol, hyaluronic acid, vitamin E and green tea. It comes in a 1.7 ounce pump bottle and is free of harmful fillers, dyes, fragrances and parabens. It is 71% organic and followed by a money back guarantee. Reviews show that this product is extremely popular. Users find that a little goes a long way making it extremely cost effective. It is also lightweight and doesn’t leave behind any greasy residue. People don’t experience any breakouts and this cream results in softer and smoother skin while at the same time reducing wrinkles and fine lines. 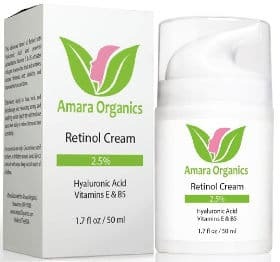 This Amara Organics Retinol Cream contains wildcrafted green tea appearing almost in the end of its ingredients’ list. Also, 2.5% Retinol as well as hyaluronic acid, vitamins E and B5, aloe vera, jojoba oil and others. It comes in a 1.7 ounce container with a one year hassle free money back guarantee. The company claims include erasing fine lines and wrinkles, stimulating collagen, fading discoloration, brown spots and acne scars, improving skin texture and tone as well as unclogging pores for a more clear complexion. Users say that this cream helps reduce fine lines and wrinkles while leaving their face feeling soft and dewy. It also improves their skin tone and texture. It is lightweight, has a natural scent and absorbs into the skin easily. 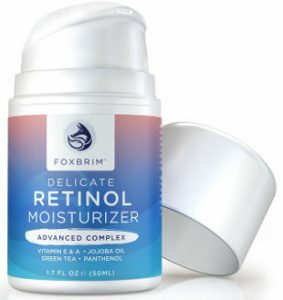 If you want to combine Retinol with Green Tea, then the Foxbrim Retinol Moisturizer is a good option. It contains 1% Retinol, vitamin E and Panthenol as well as green tea, jojoba oil, propolis, aloe vera, shea butter and others. It comes in a 1.7 ounce airless pump bottle and is suitable for both men and women as well as all types of skin. The company backs their product with a full refund guarantee. If you want to use this product during the day, you should also use a face sunscreen since retinol moisturizers can trigger Sun sensitivity. Reviews for this Foxbrim premium cream and moisturizer are very positive with the vast majority of users really liking it and finding it extremely beneficial. People say that it absorbs easily into the skin leaving behind no residue. It is lightweight and doesn’t irritate skin. Several of them have mentioned that not only does it hydrate their skin but they also feel that it reduces fine lines and wrinkles and tightens their skin. 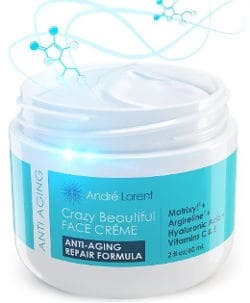 The good thing about this Andre Lorent anti aging face cream is that apart from green tea it also contains the peptides Matrixyl and Argireline, other peptides as well as hyaluronic acid and vitamins C and E.
The amount of these active ingredients used is not mentioned and neither can be inferred. Nevertheless, the green tea is presented in the beginning of the list. 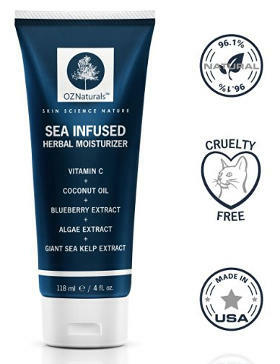 This face cream is paraben free and contains no fillers, SLS, artificial fragrances or petrochemical derivatives. Users state that this face product does a great job at reducing fine lines and wrinkles. It also improves their skin texture and leaves their complexion feeling softer and looking brighter. It absorbs extremely well and is lightweight, non greasy and with a neutral scent. 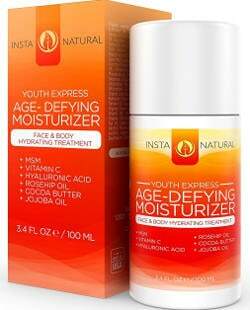 The InstaNatural Age Defying Moisturizer is a natural and organic formula that comes in a 3.4 ounce container and is suitable for both face and body use. Along with green tea, it contains Vitamin C and B5, cocoa butter, cucumber distillate, MSM, rosehip oil, hyaluronic acid and aloe vera. It is free of alcohol, parabens as well as sulfates and is backed by a lifetime money back guarantee. 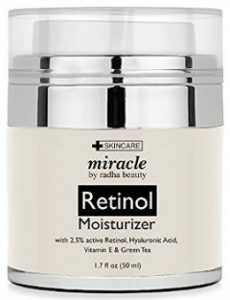 Judging from the users reviews, this moisturizer is very popular and well liked. People like that it is easy to apply without leaving behind any oily or sticky residue and that it doesn’t cause any irritation. They also mention that their skin is softer, clearer and brighter and that this product really does help reduce fine lines and wrinkles. 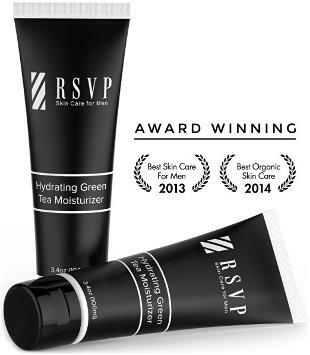 The RSVP Hydrating Green Tea Moisturizer is a natural moisturizer for men. It comes in a 3.4 ounce tube and is free of common skincare irritating ingredients. It contains both green tea and black tea as well as other skin healthy ingredients such as Aloe Vera, citrus fruit extracts, Shea butter, Sunflower oil, Jojoba seed oil, Pumpkin seed extract, Cucumber and others. Men like that this moisturizer hydrates their skin and reduces wrinkles while leaving their face feeling smooth and soft. It also goes on smoothly, absorbs into the skin quickly and does not feel greasy. Proactiv is used to help fight acne and this Proactiv Green Tea Moisturizer is recommended for daily use to relieve skin dryness. It comes in a 3 ounce container and is non-comedogenic (doesn’t clog pores). It contains hydrating ingredients, emollients and minerals. Users mention that it goes on well and absorbs into their skin easily and quickly. It has a light pleasant scent and leaves behind no greasy sensation. They also feel that it leaves their skin feeling soft and smooth while helping them control acne. Nevertheless, few users were not satisfied enough with the amount of hydration it provided to very dry skin. In addition, a couple of users referred to the appearance breakouts but I was not able to find the product’s ingredients in order to see if there are ingredients that could have caused this kind of irritation. 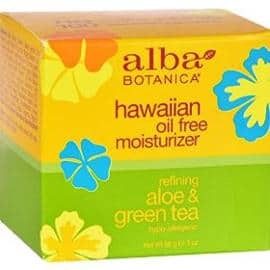 This Alba Botanica Hawaiian oil free moisturizer comes in a 3 ounce container and contains Aloe and green tea. Although I was not able to find the full list of its ingredients on their official site since it was under maintenance, some people complain that although it is not included in the list, it contains Dimethicone which is a type of silicone. The company claims that this green tea product balances pH levels in the skin, it is hypoallergenic and gentle for all skin types. Overall reviews are very positive. Users like the fact that it is oil free and absorbs well into their skin. It has a mild scent, doesn’t seem to irritate the skin and, according to the people, it is also good for acne prone skin. Finally, it hydrates their skin fine, leaving it looking fresh and dewy. In conclusion, after reviewing some of the best green tea moisturizers, I can say that green tea is an antioxidant ingredient that is beneficial for the skin but obviously has to be combined with other effective ingredients to create a more powerful anti aging and skin improving formula.